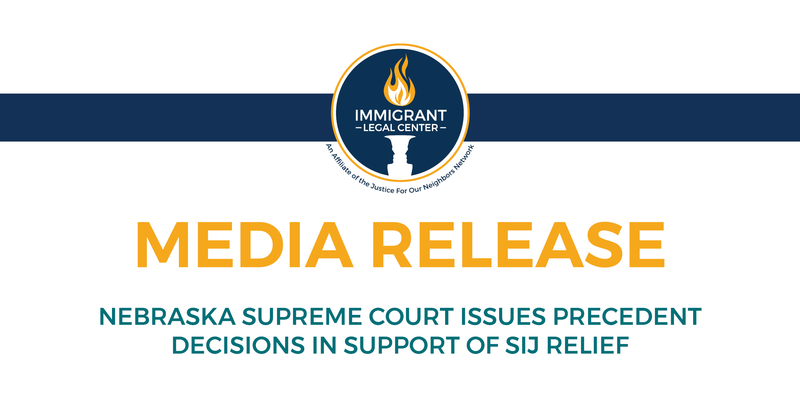 Omaha, NE – The Immigrant Legal Center applauds the Nebraska Supreme Court’s twin precedent decisions issued today reaffirming that eligible abused, abandoned, and neglected immigrant youth in Nebraska are entitled to obtain the state court orders needed to pursue Special Immigrant Juvenile (SIJ) Status. SIJ status can be granted by immigration authorities after a state court has made certain findings related to whether parental reunification is viable due to abuse, abandonment, or neglect; and whether it is in the child’s best interest to be returned to his or her country. SIJ can lead to permanent residency and U.S. citizenship. “Today’s rulings represent a major advance in the rights of vulnerable immigrant youth in Nebraska,” said ILC Legal Director, Charles Shane Ellison. In both cases, the Nebraska Supreme Court utilized a recent legislative victory (the passage of LB 670) to reverse the lower courts, who had refused to issue the orders needed to pursue relief with immigration authorities. Nebraska Supreme Court Report in RE Guardianship of Luis J.
Nebraska Supreme Court Report in RE Guardianship of Carlos D.
Amici Curiae in the Matter of the Guardianship of Carlos D.